In this Step we explore two case studies that provide further insight into conveyor belts. 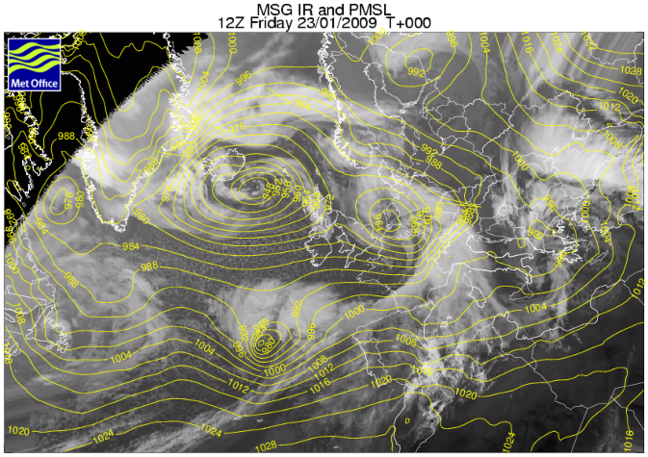 The animation above, provided by the Met Office, is from the St. Jude’s storm on 28 October 2013. 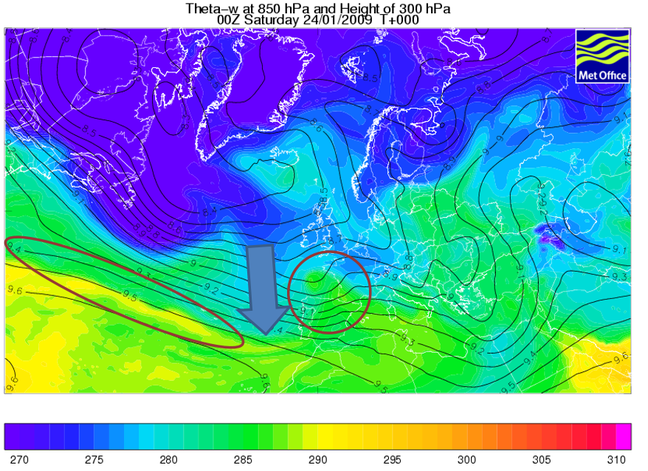 It shows a depression passing over the south coast of England. Watch the animation carefully. You should see the distinctive warm conveyor and cold conveyor clouds. Can you find the clear area between the two, where the really cold, dry air is descending from high in the troposphere? At the end of the animation, you should see the cold conveyor curve round so far that it intercepts the warm conveyor belt. Figure 1 shows the storm that occurred on January 24, 2009. It killed 27 people in France and Spain, when hurricane force winds toppled trees, walls and, tragically, a school hall. On the 23 January, the polar front was particularly strong – the temperature contours are really close together in the mid-latitudes. This meant both that the jet stream was particularly fast, and depressions were very likely to develop. Figure 2: A satellite image, midnight 23 January © Crown Copyright, Met Office. The satellite image from midnight on 23 January 2009, in Figure 2, shows a Low to the south-east of Iceland. The clouds around it only correspond to the cold conveyor – this system has gone through its lifecycle and is now decaying. However, to the south, another system is developing. Although it’s barely noticeable on the pressure contours (yellow lines), the characteristic cold and warm conveyor belt clouds show that this is a system just beginning to develop. Figure 3: This image shows the location of warm, tropical air and cold, polar air at midnight on 23 January © Crown Copyright, Met Office. Figure 3 shows the tongue of warm, tropical air feeding into the system along the warm conveyor belt. Figure 4: A satellite image, midday 23 January © Crown Copyright, Met Office. Twelve hours later, the depression is showing up much more obviously with circular pressure contours (isobars). It is approaching the Bay of Biscay. You can still see the distinctive cold and warm conveyor belt clouds in Figure 4. Figure 5: A satellite image, midnight 24 January © Crown Copyright, Met Office. Twelve hours on again, the storm is in the Bay of Biscay and the isobars are extremely close together, particularly on the southern side, indicating hurricane force winds. However, the only remaining cloud is the cold conveyor belt one, which has wrapped around and intercepted the warm conveyor belt. 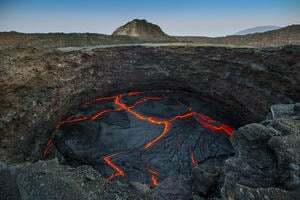 The storm is currently extremely destructive, but will soon start to decay (Figure 5). 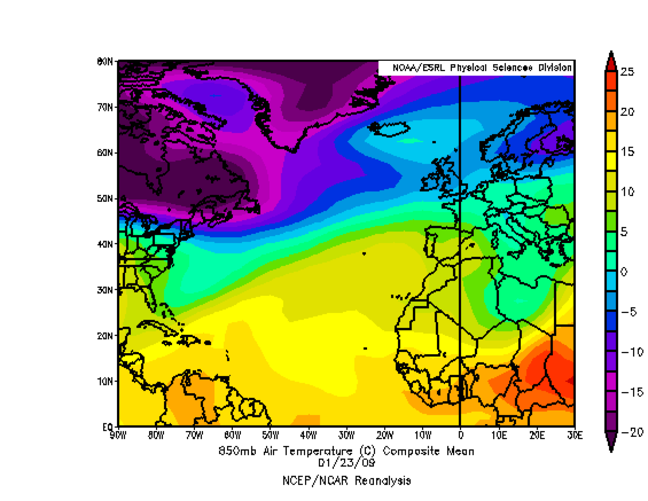 Figure 6: This image shows the location of warm, tropical air and cold, polar air at midnight on 24 January © Crown Copyright, Met Office. On the map show in Figure 6, you can see how the blue, polar air has been brought down and through the yellow/ green tropical air. Figure 7: Radar image showing rainfall, midnight 24 January © Crown Copyright, Met Office. This radar image from the same time (Figure 7) shows the intense rainfall brought by the storm. 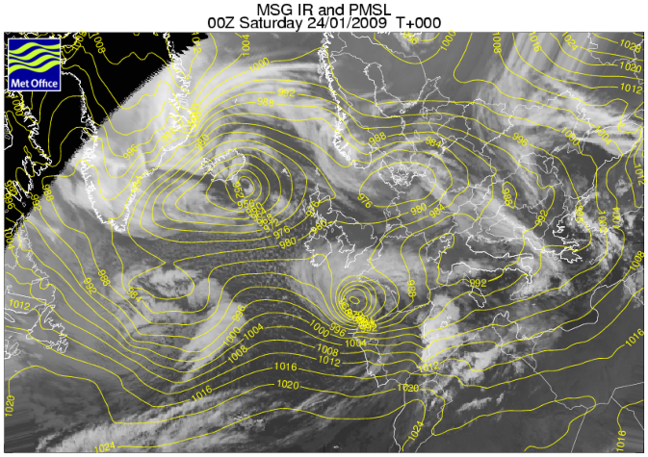 In just 24 hours, this storm crossed the Atlantic and went through its entire lifecycle. This was partly due to the steep temperature gradient across the polar front. 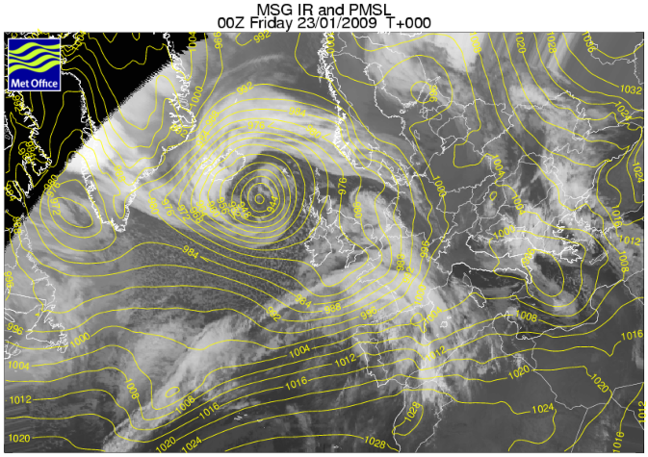 The storm was particularly destructive because it started quite far south, bringing with it its own warm, moist air. Next time a weather presenter shows a satellite image, see if you can spot the cold and warm conveyor belt clouds associated with a depression. Or, you could look at the Met Office website and, by clicking on the ‘surface pressure charts’ and ‘rainfall radar’ buttons, you can compare the isobars with the current satellite images.